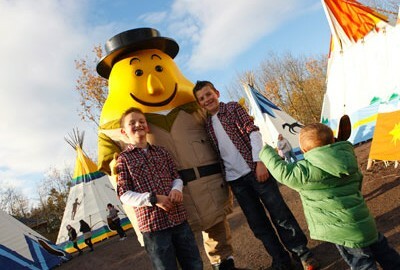 Tayto Park offers the visitor a factory tour to see how Ireland’s favourite crisps are made. You can also see Ireland’s first herd of American Bison, Amur Tigers, Corsac Foxes and Eurasian Lynxes. Get a flavour of the life and culture of Native Americans. And try a range of adventure activities. Attractions in the “Eagle Sky Adventure Zone” include the Cú Chulainn coaster (Ireland’s first rollercoaster and Europe’s largest wooden rollercoaster with an inversion), the rotator, the air race, a 5D Cinema, the extreme climbing wall, the sky walk, the Tayto twister and the zip line extreme. Attractions in the “Eagle’s Nest” zone include the steam train express, the honey pot bears, Mr Tayto’s pony rail, the shot tower, the Crispy Creek Mining Company and the super hero training wall. New to this zone (since June 2017) is the Viking Voyage. With 1.7 million litres of water, a Viking village, 5 replica Viking ships and 20 life size Vikings, the Viking Voyage ride is a unique addition to Tayto Park. The project involved Viking experts from Sweden and also theming contractors who have worked in major worldwide theme parks and film sets including Disneyland and Game of Thrones. The construction team used Viking building methods from 1,000 years ago to create wattle fencing, Viking ships, currachs and thatch. Other general attractions include Ice Valley, Dinosaurs Alive and the Vortex Tunnel. Ice Valley – Travel back in time to the last Ice Age and view magnificent megafauna and a spectacular display of animatronic ice age animals. Meet the Mammoth, the Cave Bear, the Sabre-Toothed Cat, Giant Irish Deer and much more. Dinosaurs Alive – Immerse yourself in the Mesozoic era with this tail-thrashing, roaring and clawing animatronic exhibition featuring the mighty Tyrannosaurus Rex, Stegosaurus, Apatosaurus and more. Vortex Tunnel – Get ready for a virtual, mystifying, turning, tilting, crazy experience like no other. Apart from the overall admission price, there are additional charges for each “ride”. You can purchase an all-day multi-ride wristband which gives you unlimited access to all rides. Realistically, each person entering the Park will pay €36.50 during peak times (the admission fee plus the cost of a wristband). “Peak” means July & August. “Off Peak” means April 6th – June 30th inclusive and the September- October Mid Term Break. There is no crisp factory production on Sundays and Bank Holidays and production is limited on Saturdays. There are discounts for booking online.